Every fight starts out on the feet. It doesn’t matter how good a fighter’s ground game is. Whenever that bell rings and the referee tells the fighters to touch gloves, they come out swinging. It’s the natural progression of things in a fight. Which makes Muay Thai so extremely important. With a complete set of Muay Thai skills, anything is possible, ground game or not. And as the two guys in this video have proven, Muay Thai can be an absolute killer. 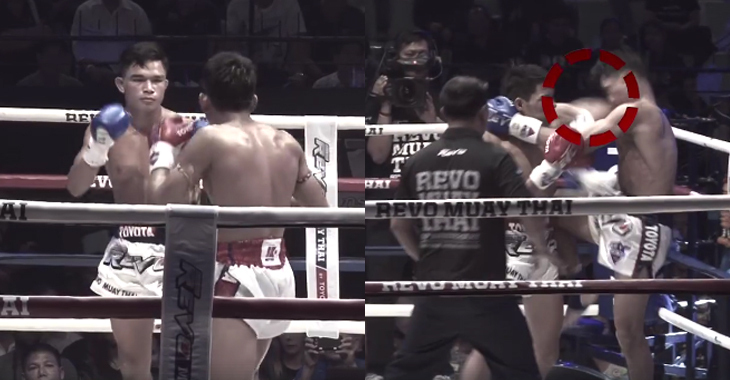 On December 9th, 2016 at Thailand’s famous Lumpinee Stadium, two guys with long names went to battle. It was Petdam Petchyindeeacademy (that’s not a typo) against Sing Paranchai. Evolve Vacation breaks down this incredible fight with a great analysis of what happened. In this Evolve University fight breakdown, we will analyze Petdam’s victory over Sing Paranchai. In this clash of conflicting styles, this matchup pits Petdam, a southpaw fighter, against Sing Paranchai, an orthodox fighter. In the early rounds, both fighters engage in a patient process of feeling each other out. They seemed evenly matched, with both being technical fighters. They engaged with punches and kicks at close range. In round three, the tempo picks up as both fighters turn the intensity up a notch. Petdam is the more aggressive of the two, getting the better of the exchanges. While Sing Paranchi awaits the opportunity to counter attack and looks to engage in the clinch. Round four really heats up as both fighters trade heavy blows and exchange knees in the clinch. After the referee breaks the clinch, Petdam attacks with two left kicks to the body, followed by a left cross and left elbow. The strike penetrates Sing Paranchai’s defense. In an attempt to retaliate, Sing Paranchai charges ahead and engages. However, this would turn out to be his downfall as he charges straight into a vicious left elbow. In an instant, it’s lights out and all over.